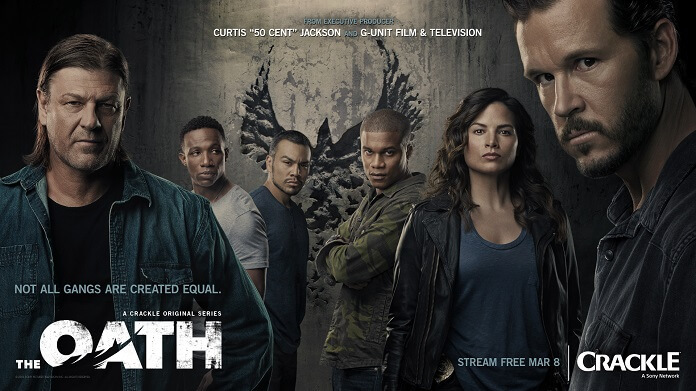 Crackle’s just debuted a new trailer for the dramatic series The Oath which is set to premiere on Thursday, March 8, 2018. Season one will consist of 10 episodes, with the entire season available on March 8th for those into binge-watching. The season one cast includes Sean Bean (Game of Thrones), Ryan Kwanten (True Blood), Cory Hardrict (American Sniper), Katrina Law (Arrow), Arlen Escarpeta (The Magicians), and J.J. Soria (Animal Kingdom). The ensemble also includes Michael Malarkey (The Vampire Diaries), Eve Mauro (CSI Miami), Kwame Patterson (The Wire), Linda Purl (Homeland), and Elisabeth Röhm (Law & Order). The original drama was created by Joe Halpin (Hawaii Five-O, Secrets and Lies), a former Los Angeles County Sheriff’s Department deputy. Halpin is the writer and showrunner and Curtis 50 Cent Jackson, Todd Hoffman, Dennis Kim, and Anne Clements executive produce. Jeff T. Thomas (Blindspot) and Luis Prieto (Kidnap) directed season one. The Plot: The Oath takes an unforgiving look at the complicated dynamics in these organizations and documents the lives of those willing to risk it all, to have it all. The gritty, action-packed drama, explores a world of gangs made up of those sworn to protect and defend and sheds light on corrupt and secret societies that are nearly impossible to join – only a select few make the cut-but once inside, members will do what they must to protect each other from enemies on the outside and from within their own ranks. Tom Hammond, portrayed by Bean, is a hard-charging cop and ruthless leader of the prominent gang made up of those who are meant to enforce the law. After doing a deal with an undercover FBI agent, Hammond finds himself behind bars but after he’s released, his desire to make his way back to the top of the food chain and back in control of the gang he once led puts him head to head with those who used to have his back. Kwanten plays Steve Hammond, son of Tom Hammond and the leader of a cop gang, The Ravens. A cool, pragmatic, reluctant leader with the mind and instincts of a shrewd tactician, Hammond is a survivor–a natural protector who values taking care of those closest to him, his family, his team.